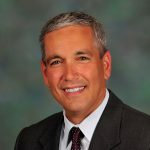 Robert Casalou is regional president and CEO of Saint Joseph Mercy Health System (SJMHS), a five-hospital health organization in southeast Michigan that is widely recognized as a national leader in high quality and compassionate care. SJMHS is comprised of five hospitals, six cancer centers, five ambulatory care centers, more than 2,700 physicians and 12,000 employees. Casalou founded and currently serves as the captain of the Team Joe’s Cycling Team. Casalou joined SJMHS in 2008 as president and CEO of St. Joseph Mercy Ann Arbor and Livingston hospitals, which made the “100 Top Hospitals” list seven times under his leadership. Prior to coming to SJMHS, he served as president of Providence Park Hospital, where he was responsible for overseeing the construction of the 200-bed, full-service teaching hospital in 2008. He is board chair of the Make-A-Wish Foundation of Michigan, a member of the American Heart Association Midwest Affiliate Board, a delegate to the American Hospital Association Regional Policy Board 5 and is a member of the Together Health Board and Integrated Health Associations (IHA) Board a multispecialty medical group located in Southeast Michigan. Rob is the immediate past Chair of the Michigan Hospital Association Board and the American Heart Association Metro Detroit Board of Directors. In addition, Rob is a member of the Griffith Leadership Advisory Committee, University of Michigan School of Public Health and a member of the American College of Healthcare Executives (ACHE).